Transporting inmates for live visitation sessions with family and friends is an extremely costly and time-consuming task for corrections staff, one that also involves security risks. Lattice’s NetVisitTM Video Visitation solution significantly reduces these labor hours, costs, and security risks by minimizing inmate transport. For inmates, there is the added benefit of seeing their spouses, children, parents, and friends over live video on a frequent basis. Maintaining this connection and bond can promote inmate self-improvement during incarceration and help reduce recidivism upon release. NetVisit is a complete solution that includes all hardware, software and support for scheduling, monitoring and recording secure video visitation sessions. 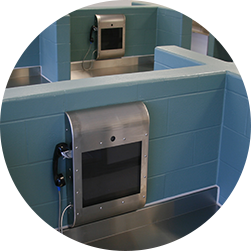 Our corrections-grade, tamper-resistant MaxVisitTM video stations are available in Powder-Coated and Stainless Steel options. These stations are highly energy-efficient – each station uses less energy than the average light bulb. We offer fixed, mounted stations, along with Mobile video units for applications such as Medical. Our NetVisit software platform features a user-friendly interface and works with any standard Web browser. Authorized corrections staff can schedule visits, monitor multiple live visits simultaneously, communicate with all parties during live sessions, and record visits to access for investigative purposes. Customizable Reports track visit history and system usage over a range of criteria input by corrections staff.